In a number of countries, particularly those that are developed, the number of riding and driving enthusiasts is increasing. With incremented disposable income among urban population and growing desire for travel to live a fulfilling life, the pool of people who are investing on riding and driving apparels is expanding. Driving apparels such as motorcycle jackets, pants, shoes, helmets, and gloves are now widely used for protective purpose. These apparels are thicker and heavier than normal clothing with weatherproof closures and pockets, substantial zips, higher collars, and are even equipped with armor. According to this business and commerce study, the demand in the global driving apparel market will expand at a CAGR of 5.3% during the forecast period of 2017 to 2025. 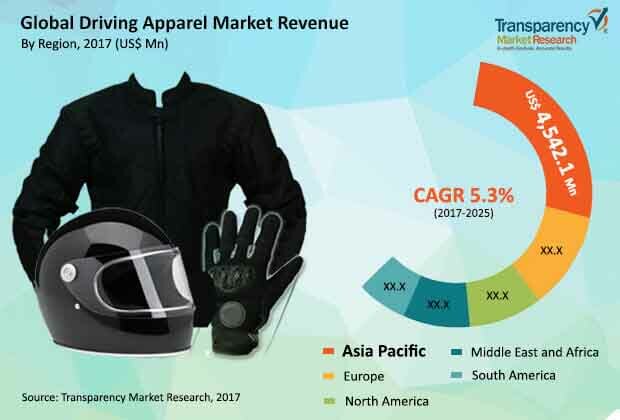 In terms of revenue, the analysts of the report have estimated that the opportunities in the global driving apparel market will translate into US$18,565.0 mn by the end of 2025, substantially up from its evaluated worth of US$12,312.5 mn in 2017. There has been a surge in adoption of protection gear and other safety accessories in order to prevent serious injuries and even death. Several safety regulations or laws regarding the use of helmets, jackets and other protection clothing have been imposed by regulatory authorities, which in turn is likely to fuel the growth of the market for driving apparel. In addition to that, rising popularity of motorsports such as Formula One, IndyCar, and MotoGP are expected to reflect positively on the global driving apparel market. On the other hand, cost of these apparels and lack of awareness among a substantial chunk of consumers are obstructing the market from attaining its true potential. The driving apparel market has been segmented on the basis of product type into clothing, footwear, and protection gear. In 2016, protection gear was the largest contributor in terms of demand, accounted for a market share of nearly 50%. Protection accessories such as helmets, knee cap, elbow cap, and armor and spine guard among others play an important role in improving safety and are specifically designed with armored protection to prevent vulnerable body parts of the rider from injury. Introduction of advanced materials like fiberglass reinforced plastic and carbon fiber have made helmets lightweight and useful. Moreover, manufacturers are continuously focused on integration of electronics in protection gear and development of helmets with head up displays, which is likely to increase the demand for these accessories even further in the future. On the basis of material type, the driving apparel market has been categorized into leather, synthetic, and natural fibers. While synthetic materials provided for the maximum demand in 2016, the leather segment is expected to exhibit the highest growth during the forecasted year as leather prices are reducing with every year. On the basis of vehicle type, the driving apparel market is bifurcated into two wheeler and four wheeler. The two wheelers segment held the highest share in the market in 2016, which was a result of increasing demand for protection and safety against injuries during driving during various racing sports. Geographically, Asia Pacific has been identified as the most profitable region, providing for nearly a third of the total demand in the global driving apparel market. This prosperity of the Asia Pacific driving apparel market, which is estimated to be worth US$6,603.6 mn by the end of 2025, is a reflection of foray that some of the leading companies of this market are making in the region. A number of driving apparel retail outlets have opened in countries such as China, Japan, and India, and increasing government regulations are further expected to fuel the demand from the region. However, Europe and North America are two other profitable regions that vendors are concentrating on, with the demand from the latter region primed to expand at an above-average CAGR of 6.2% during the forecast period of 2017 to 2025. Dainese S.p.A. (Italy), Alpinestars S.p.A. (Italy), Fox Head, Inc. (U.S.), ThorMX (U.S.), and Scott Sports SA (Switzerland) are some of the key companies currently ahead of the curve in the global driving apparel market. There has been increasing cases of road accidents worldwide, owing to lack of driving skill, street racing, notable speeding, impairment due to alcohol and drugs and several other factors. Hence, various safety laws have been implemented by governing bodies worldwide regarding usage of helmets, jackets and other driving apparels. This factor is expected to fuel the growth of the market to a huge extent. Motorsports is one of the fastest growing and most popular spectator sports across the world. For example, annual crowd appearance at all U.S. motorsports events is assessed to be more than 15 million. With increasing occurrence of such racing events, the demand for protection clothing is also rising, primarily due to safety issues of the rider and implementation of strict laws in order to prevent critical injuries in the event of an accident. In addition, there has been a surge in adoption of e-commerce among consumers in developing countries, which in turn increased online retail sales of these apparels. Leading manufacturers are continuously focused on technological innovation and integration in material composition and design of driving apparels, which in turn is likely to create significant growth opportunity for the market. This report on driving apparel market highlights the current market summary scenario along with the future expected market growth during the forecast period from 2017 to 2025. Moreover, various economic, political, technological and social factors that are likely to affect the present and future demand of driving apparels have also been provided in this report. In addition, information of major players operating in the market along with their market share and major strategies adopted in order to maintain leading position is also given in this report. The report also contains the current market size of driving apparels in terms of revenue (USD Million) and predictive forecast from 2017 to 2025. On the basis of geography, the market has been classified into North America, Europe, Asia Pacific, Middle East and Africa and South America.